The garden was also invaded! The plumbers used it as a staging area for both new and old pipes! I've discovered something interesting about workers. A ladder laid across a small path that leads through a prize woodland garden does not mean "path closed". It means jump over and smash as many plants as you can. In my younger years, I would have been pulling my hair out, but, gardens can be repaired and perennials nearly always recover. A sense of humor is essential for homeowners and gardeners. In the midst of the noisy chaos, I have found peace in the garden. My friend Sarah and I sat on the Waiting Bench and marveled at how beautiful the asters looked. Sarah is a neighbor and knows the gardening conditions at Clay and Limestone. She is a garden designer and coaches me when I get stuck. We sat, we talked, we walked around the garden and then we made a plan. I'd asked her to help me think through options about Hedge, the Behemoth. I so wanted to replace him with a border of evergreens, deciduous shrubs and perennials. Alas, there can be no bulldozing of Hedge. We decided that hand digging out sections made more sense then my hoped for simple solution of toppling him. It wouldn't have been simpler after all! The damage to the 75 year old Bur Oak would be tremendous and the hillside would have to be rebuilt. Instead, a smaller section near the Susans Bed will be replaced with ilex or another evergreen and he will be thinned. He has grown so wide that a third of his width along the street side can be removed without compromising privacy. Privacy is the only thing my dear Mr I (go here for that story) has ever wanted. So I shall make sure we keep this garden private. One area of greatest concern for me, has been a particularly wild section where the vincas have taken over. That's where we'll bobcat. 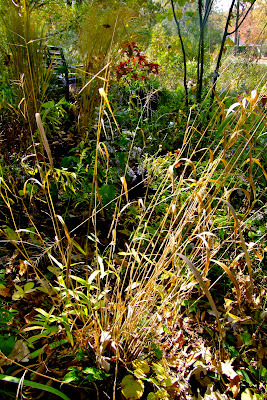 I've never shown you that part of the garden~ Glimpses, yes, but, not a full on look at the vinca kingdom. The limestone bedrock is close to the surface and laced with tree roots from numerous shag bark hickories and oaks. 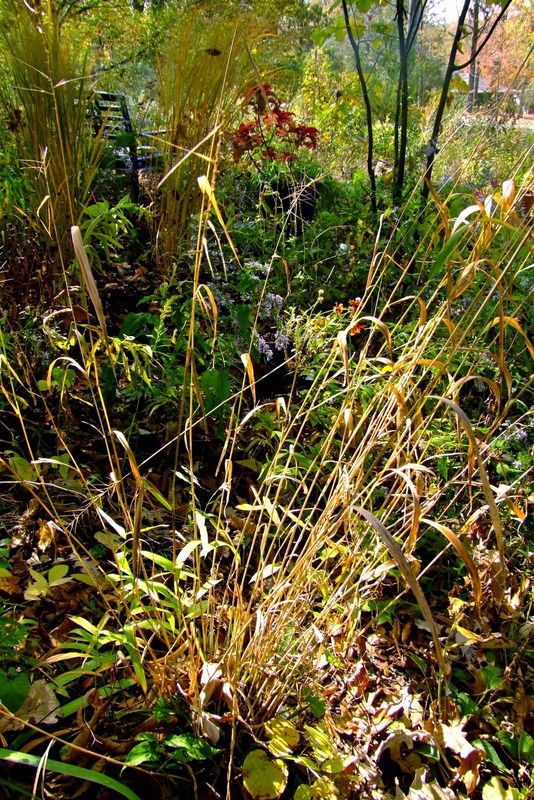 It's a part of the garden that has killed many different shrubs and trees. The very good news is that Rough Leaved Dogwood (Cornus drummondii) loves it there! We plan to let it colonize even more. Junipers will also survive~and they'll be used for privacy. We'll bobcat the area clean and add an 8 foot round stock tank pond. Yippee! Finally Pam (Digging) I'll have my big pond! Sarah helped me renovate before. You might remember that the Garden of Benign Neglect got a much needed update and before that a flagstone walk was added to the front porch. I trust her design sense and I know she'll get the best crew. Even though I have a pretty good idea of what it will look like, I can't wait to see the sketch! A plan is real when you have a design in hand. I can't wait to show it to you! We'll meet for coffee and scones on the porch! Gail: It seems that bench had the magic of adding to the 'domino effect' in the garden anyway. I am happy to hear you found solace in dreaming and dreams that will soon be a reality. While it's frustrating to have areas of the garden that just won't 'come around' on their own, it's fantastic to have a garden-design friend who lives next door and the ability to 'bobcat' the area, doing what you would like with it! Love the idea of adding the pond where you can't get anything to grow. I hear you loud & clear re: the ladder blocking the path--funny how sometimes people miss the message! It sounds like you are having more fun and excitement, planning this new 'change', and it will be such a treat to see it when your plans are finalized & then put into place. What is it with workers who don't respect plants? I don't get it. I pointed out the couple plants to the guy who replaced the walls on our shed, and he still crushed one. Like you said, though, it did recover. I am thankful the crew who resurfaced our street and replaced the curb were extra careful, and watched where they stepped. They were so sweet! I look forward to seeing the changes you make in that difficult area. It will be cool to have a pond there. I hope the rest of the indoor work goes smoothly. The happiness in your voice about hedge is coming through loud and clear, dear Gail! It sounds like a wonderful plan, and doable. The plants trod upon will regrow. You have an excellent attitude! Garden planning--so fun! Sounds like you have some sizable projects to tackle. Can't wait to see the process. This post started and ended on two different notes! Your new project sounds excellent ~ I'm so glad you'll get to put your stock pond in! Will there be sun for water lilies and such to bloom? I want privacy too so I totally hear Mr. I! It will be such fun watching the changes! If we decide to move, I'll look not for a house, but for a neighbor! She/he should be a garden designer! Gail and Sarah, your plan sounds exciting. I love ilex, we used it for our hedges, and it is wonderful. As for the vinca - wow! I'd never think about a bobcat! Rather than fight it for years with partial success, use this heavy artillery! Great! Will wait for further posts with pictures! You caught my eye with that purple bench, beautiful! Dear hubby keeps threatening to tear up my kitchen, which admittedly needs renovation, but I'm terrified of the, aptly named, repair dominoes. I really don't need to know what my plumbing looks like behind the walls. My backyard neighbor used a bobcat to remove ivy and vinca with great success. It was a big area and worth the full-on assault. A pond - how exciting! And it's wonderful to be able to plan such an exciting project and take your mind off the chaos of workers trampling your plants! Great changes await. I like Tatyana's comment about picking the neighbors rather than the home. Good idea. I liked the photo of the robin at the birdbath. Our robins have all left for the season. I have not seen one in a few weeks. Oh, this sounds so exciting, and more fun than getting ductwork and plumbing repaired! Your garden plans sound so exciting, Gail. And your plumbing problems sound like a nightmare! I saw on the news that Nashville got some much needed rain. I wondered if it fell on your little part of Nashville. Yay... I was so hoping it would make it all the way here but it didn't. Hopefully next time. Your new plan sounds great. I can't wait to see it on paper too. Then to watch as it comes to fruition. Something to look forward to. Soon the workers will be out and you will feel like you have a new place. One thing always leads to another when doing home repairs. Mmmmmm, tea and scones sound lovely. As do all the changes getting ready to happen in your garden. A pond--so exciting. I look forward to hearing and seeing all the changes as they come. Cast iron pipes! Goodness--they are old. Hope the domino effect stops there, and your garden survives the workers. Trampled plants will recover. So glad you will finally get your stock tank. Hooray. How wonderful to look forward to garden change in the midst of extensive home repair/renovation! I wish we could just magically have things like that done, but of course, it's the process that makes us appreciate the end point. I'm looking forward to seeing what you came up with for your garden! I remember the vinca area I think your friend will do a great job with it based on her prior work! Sorry about the pipe repair. It's always something with a house isn't it? Good luck with the remainder of the repairs, and I can't wait to see the new garden areas! Why is it that workers cannot avoid destroying plants? Sounds like a lot going on there Gail! This is a much better time than earlier in the gardening season for all those repairs. The trodden on, piled on places will rest and heal over the winter. It hasn't been so long since last fall when we had foundation and brick work done, and our patio and walks torn out and replaced. I still remember the ugly and the mess. There was alot of cleaning up to do after the contractors were finished, but everything came back strong and healthy this spring. How exciting about Hedge, and the stock tank pond. I'm looking forward to seeing the changes. The waiting bench in all it's purpleness looks fantastic with autumn. Looking forward to seeing the new garden! Thanks! Yea for the stock-tank pond!! Boo for the construction chaos and mess, but it's all to the good, so it must be put up with. I can't wait to see your garden changes, especially the pond. We had to do the same with our old sewer pipe a couple of weeks ago--with similar garden destruction. Oy! Still an opportunity to try something new in the garden is always fun. Looking forward to see what you and your neighbor come up with. Hope the repairs go well. 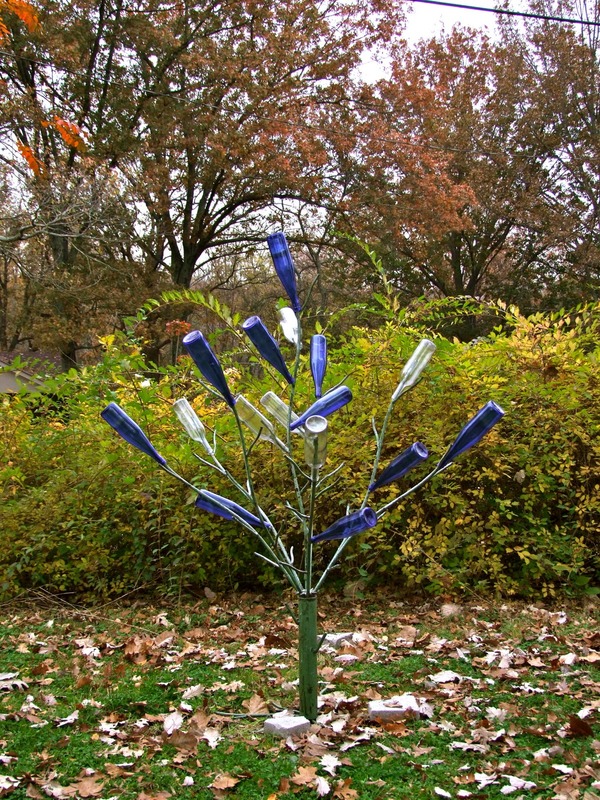 Your garden looks great, love the bottle tree. Oh, Gail, I do understand that "domino effect" and sympathize with you. Last year when we had our roof replaced, I was concerned the workers would smash parts of the garden, but I was pleasantly surprised. Other than a few stray roofing nails, they were very careful, and even moved some pots I had forgotten out of harm's way! All your plans sound wonderful--how nice to have someone like Susan who can offer a different perspective and fresh ideas for your garden. I'd love to sit with you on the waiting bench to see the end results! Gail, so you will have a pond! Can't wait to see it. Gail it sounds like you have a lot going on! I'll bet you'll be glad when the workers are gone and not smashing the plants. Always happens. At least they'll come back. I am with Mr. I regarding privacy, but it's good you'll be able to make some changes to Hegemony. Whew, how very exciting. Sometimes it just takes a while to know what you need to do to a troublesome area. Living with it and really getting to know it. I'm happy you are over the contractors, ugh! Inspired by you, I am going to have a blue bench next spring. Good luck with your repairs! Mmmm...scones. I'll bring the preserves and clotted cream ;) I'm so envious that you're getting your pond! I miss our pond. We've just had so many other things going on, that's a project that's a bit further down the list for us. Hope your garden rebounds quickly after the repair crew assault. I hate it when others don't respect your hard work, and your property. You always have the greatest perspective on life, Gail. Yes, humor is one of our greatest gifts. All looks lovely through your eyes. Think of glorious spring in your garden! I must keep this in mind myself while updating our kitchen up north, running back and forth, and dreaming of coffee and scones with you on your porch! I can't imagine your garden being more beautiful than it already is ... but I know it will be! Your plans sound most exciting. The Fairy rose is very pretty. We two pink ones that do quite well in central Alabama.